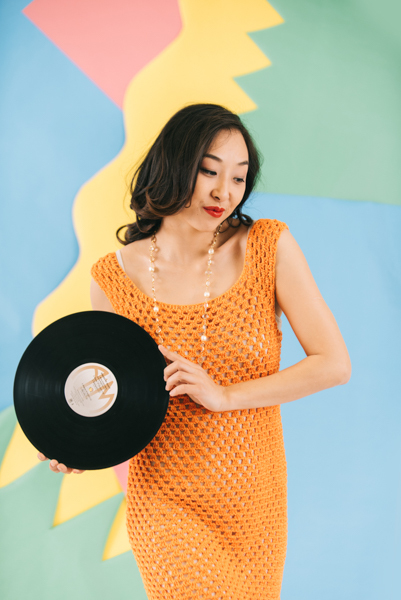 This vintage dress will inspire you to get out your record player and revisit your favorite hits from days gone by. 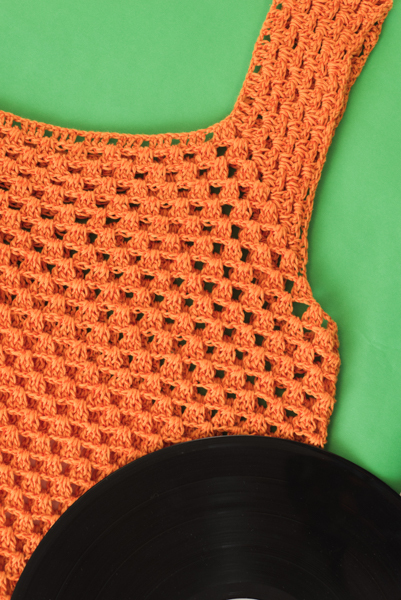 Make this light, sleeveless piece for your next spring outing by working in rounds from the top down. 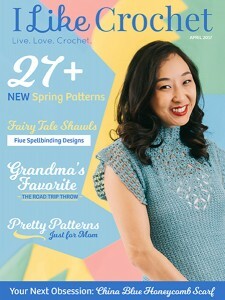 This crochet dress pattern is worked in rounds and from top down. The square yoke is worked first then the bodice. I used chainless starting dc for every first dc of each row instead of ch 3. 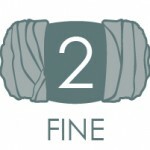 Another good crochet technique to use is ch 2, then dc in same stitch (counted as first dc). In the pattern, I simply state dc into first stitch for every first dc of each row, so just choose your best technique. Rnd 1: Ch 152 (168, 184), sl st in first ch to form rnd. Rnd 2: Dc in first ch, ch 1, sk next ch, *(dc in next 3 ch, ch 1, sk next ch) 8 (9, 10) times, dc in next 2 ch, (dc, ch 3, dc) in next ch, dc in next 2 ch, ch 1, sk next ch; rep from * twice more, (dc in next 3 ch, ch 1, sk next ch) 8 (9, 10) times, dc in next 2 ch, (dc, ch 3, dc) in next ch, dc in last ch, sl st in first st to join. Rnd 3: Dc in first st, 2 dc in next ch-1 sp, ch 1, sk 3 sts, (3 dc in next ch-1 sp, ch 1, sk 3 sts) 8 (9, 10) times, (3 dc, ch 3, 3 dc) in next ch-3 sp, ch 1, sk next 3 sts, *(3 dc in next ch-1 sp, ch 1, sk 3 sts) 9 (10, 11) times, (3 dc, c h3, 3 dc) in next ch-3 sp, ch 1, sk 3 sts; rep from * twice more, sl st in first st to join. Rnd 4: Dc in first st, ch 1, sk next 2 sts, (3 dc in next ch-1 sp, ch 1, sk 3 sts) 9 (10, 11) times, (3 dc, ch 3, 3 dc) in next ch-3 sp, ch 1, sk 3 sts, *(3 dc in next ch-1 sp, ch 1, sk 3 sts) 10 (11, 12) times, (3 dc, ch 3, 3 dc) in next ch-3 sp, ch 1, sk next 3 sts; rep from * twice more, 2 dc in last ch-1 sp, sl st in first st to join. Rnd 5: Dc in first st, 2 dc in next ch-1 sp, ch 1, sk 3 sts, (3 dc in next ch-1 sp, ch 1, sk 3 sts) 9 (10, 11) times, (3 dc, ch 3, 3 dc) in next ch-3 sp, ch 1, sk next 3 sts, *(3 dc in next ch-1 sp, ch 1, sk next 3 sts) 11 (12, 13) times, (3 dc, ch 3, 3 dc) in next ch-3 sp, ch 1, sk next 3 sts; rep from * twice more, 3 dc in next ch-1 sp, ch 1, sk next 2 sts, sl st in first st to join. Rnd 6: Dc in first st, ch 1, sk next 2 sts, (3 dc in next ch-1 sp, ch 1, sk next 3 sts) (10, 11, 12) times, (3 dc, ch 3, 3 dc) in next ch-3 sp, ch 1, sk next 3 sts, *(3 dc in next ch-1 sp, ch 1, sk next 3 sts) 12 (13, 14) times, (3 dc, ch 3, 3 dc) in next ch-3 sp, ch 1, sk next 3 sts; rep from * twice more, 3 dc in next ch-1 sp, ch 1, sk next 3 sts, 2 dc in last ch-1 sp, sl st in first st to join. Rnd 7: Dc in first st, 2 dc in next ch-1 sp, ch 1, sk next 3 sts, (3 dc in next ch-1 sp, ch 1, sk next 3 sts) 10 (11, 12) times, (3 dc, ch 3, 3 dc) in next ch-3 sp, ch 1, sk next 3 sts, *(3 dc in next ch-1 sp, ch 1, sk next 3 sts) 13 (14, 15) times, (3 dc, ch 3, 3 dc) in next ch-3 sp, ch 1, sk next 3 sts; rep from * twice more, (3 dc in next ch-1 sp, ch 1, sk next 3 sts) twice, sl st in first st to join. Rnd 8: Dc in first st, ch 1, sk next 2 sts, (3 dc in next ch-1 sp, ch 1, sk next 3 sts) 11 (12, 13) times, (3 dc, ch 3, 3 dc) in next ch-3 sp, ch 1, sk next 3 sts, *(3 dc in next ch-1 sp, ch 1, sk next 3 sts) 14 (15, 16) times, (3 dc, ch 3, 3 dc) in next ch-3 sp, ch 1, sk next 3 sts; rep from * twice more, (3 dc in next ch-1 sp, ch 1, sk next 3 sts) twice, 2 dc in last ch-1 sp, sl st in first st to join. Rnd 9: Join yarn and insert hook into any ch-3 sp of Yoke, work 3 dc in same sp, ch 1, sk next 3 sts, (3 dc in next ch-1 sp, ch 1, sk next 3 sts) 15 (16, 17) times, 3 dc in next ch-3 sp, ch 9 (13, 17), sk the next whole side of Yoke, work 3 dc in next ch-3 sp, ch 1, sk next 3 sts, (3 dc in next ch-1 sp, ch 1, sk next 3 sts) 15 (16, 17) times, 3 dc in next ch-3 sp, ch 9 (13, 17), sk the next whole side of Yoke, sl st in first st to join. Rnd 10: Dc in first st, ch 1, sk next 2 sts, (3 dc in next ch-1 sp, ch 1, sk next 3 sts) 16 (17, ) times, (3 dc in next ch, ch 1, sk next 3 ch) 2 (3, 4) times, 3 dc in next ch, ch 1, sk next 3 sts, (3 dc in next ch-1 sp, ch 1, sk next 3 sts) 16 (17, 18) times, (3 dc in next ch, ch 1, sk next 3 ch) 2 (3, 4) times, 2 dc in last ch, sl st in first st to join. Rnd 11: Dc in first st, 2 dc in next ch-1 sp, ch 1, sk next 3 sts, (3 dc in next ch-1 sp, ch 1, sk next 3 sts) 36 (40, 44) times, 3 dc in next ch-1 sp, ch 1, sk next 2 sts, sl st in first st to join. Rnd 12: Dc in first st, ch 1, sk next 2 sts, (3 dc in next ch-1 sp, ch 1, sk next 3 sts) 37 (41, 45) times, 2 dc in last ch-1 sp, sl st in first st to join. Rnds 13-56: Rep Rnds 11-12.